As many people from all sides have noted, why are the armed forces even using those rubber pellet grenades? They've been consistently causing life changing injuries each time they've been used against the activists, along with the robust nature of the armed forces. The even robuster targetting of leaders has just upped the ante - I question why the authorities are just escalating the mood of unrest when the protester numbers were waning a few weeks back and it was turning into an uncoordinated damp squib. Destruction of property is very much not on, as I'm sure everyone will agree. Just leave the French to themselves, honestly. It’s all they’ve ever wanted. The French Police/Security forces have been getting attacked themselves with rocks/Bricks/Bottles+ as missiles, Molotov cocktails, burning Police vehicles (a quick Google has flagged 3 such attacks this weekend) etc so violence on both sides has been met with violence (ie. descriptions of certain protests as "battlegrounds"). That would be why rubber pellet grenades are being used. Also, potentially linked the leader of the National Assembly, a Macron ally had his holiday home in Brittany firebombed. Some of the early protests involved criminal damage/violence etc (especially in Paris) and the security forces held off but that didn't stop the violence escalating from the protestors. What would you suggest the Security forces do when facing an element* hell bent on criminal damage and attacking the Police with weapons/firebombs etc of their own? Or should the Security Force members allow the violence by this element to go unchecked and allow them to carry on attacking businesses with criminal damage etc (which the criminal damage has happened week in, week out)? Plenty of Police/Security Force members have been put in hospital by attacks from protestors but you don't hear about that so much in the media and risk life threatening injuries themselves; imagine having a molotov cocktail explode over you which has happened. Also, reporters don't tend to write about the policing at peaceful protests. Another: https://www.dailymail.co.uk/news/article-6688019/Shocking-footage-shows-rival-Yellow-Vest-activists-fighting-Lyon.htmlA. This talks about 'Yellow Vests' groups fighting each other and the Police having to split them up. Apologies for the DM link but it had the video of the violence. Also according to the Reuters report, it was a teargas grenade, not a rubber pellet greande as suggested by the BBC, that was used when the protestor had his fingers blown off. This was at a protest when other reports say protestors where trying to forcibly enter the National Assembly (the Police managed to stop them climbing over the fence protecting it) and I very much doubt it would have been for a non violent/criminal damage free sit in had they got in, considering they were graffiting the outside as it was. I'm not surprised the Security Forces are targeting activists leaders. The reports I just googled all mention those involved as part of violent protests with one arrested with a wooden baton as a weapon on him. Are you suggesting the Police should give them a free pass and allow them to be violent? Also, the French do have a reputation/history of violent protest and equally a violent response by the Security Forces so it shouldn't be a surprise to anybody. *I am not suggesting everybody protesting are of this mindset but there is a decent sized group hell bent on creating violent clashes. + Anything to hand or what the 'violent' protesters can generate from criminal damage. As I say, I wonder why the French authorities are going all in on a minority. Violence begets violence. You'd think after 12 weeks they'd have more ideas and tactics than even more truncheons and rubber bullets/grenades - something that should have been left in the 70s. If the UK police were as uncouth and simplistic as the French are, we'd all be questioning their tactics and leadership. And I'm sure some leaders would say they have bats, etc, to protect themselves from unwarranted Police violence. Does it make it right? No, but it's the reality of where Macron's (lack of) leadership has let this go. Both sides tooled up because of the other and no one backing down. I suppose it's a sign of how quietly toxic France has become politically in the past 10 years. There has been violence (as said previously by a decent sized element) from very early on and the authorities/security forces stood off. The violence then escalated and the Authorities changed their approach and responded. Can you please talk me through what the Police should do, not what they shouldn't be doing? The authorities are targeting the violent groups' leaders, seems a sensible approach to me. They aren't arresting/targeting the people at peaceful rallies. Why are you downplaying the premeditated violence/criminal behaviour/attacks on the Security forces and property on a weekly basis by these elements? Can you justify why a protestor would carry a Molotov cocktail, I can't think of a single reason in this case? Or burn 3 Police vehicles in 1 weekend? Why the deliberate targeting of businesses with criminal damage/arson/looting etc by these violent demonstrators, how would you stop this? You criticise the authorities/Police for arming themselves but then justify the protestors doing so. So is it alright that a Policeman gets hurt, but those instigating the criminal/violent behaviour should be treated with kid gloves, are the Security forces' lives worth less? As far as I'm concerned; the violent protestors live by the sword, they die by the sword (so to speak). The Police shouldn't need the weapons they are using but then they are getting targeted by weapons themselves from some demonstrators so fair enough. If you chuck a Molotov cocktail or enable somebody else to do so, don't be surprised if you get twatted by a baton or shot with a rubber bullet. Also, if a demonstration tried to smash its way forcibly into the Houses of Parliament (the equivalent) our Police forces would be tooled up and in riot gear just like the French. Look at how the Police dealt with the Tottenham riots and subsequent riots elsewhere. Also, our Police would have targeted the leaders of violent factions as well. The violent protestors (Left wing/Right wing and those looking for a fight hence the scrap in Lyon) have latched on to the original movement which had specific issues and depending on your viewpoint reasonable points of contention. These violent protestors are using the protests as a smokescreen for criminal behaviour, general violence and a ruck with the Police. Macron has become a convenient excuse for them to act this way. Both sides have big issues and are wrong in this. I have no real ideological support for either side in this, I've said I don't agree with the violence, I don't agree with destruction of property. I don't believe that physical intimidation of the protest movements leaders is right - by all means arrest and prosecute them as their law dictates each and every week. The French forces have made martyrs out of the leaders. We should send the mustard cords over. Who exactly is physically intimidating who exactly? The violent armed protestors are closing down major parts of Paris and elsewhere, intimidating the locals who live there/damaging businesses (potentially destroying livelihoods through criminal damage, stopping customers visiting the area etc), openly looking to ruck with the Police on a weekly basis in a premeditated way. These elements are experienced in fighting and avoiding their identity being known. How are the police supposed to make those arrests of armed/rioting people but not be armed themselves to do so? Ask politely? At the start (for quite a few weeks) the Authorities/Police did step back and the violent elements escalated the violence/criminal damage, even after Macron caved in on the tax rises etc (which is what the initial protest was about). This was when the Authorities changed their approach. The violence didn't escalate because the Police changed their tactics or "physically intimidated" the leaders of the violent protests as that violence was already actively there. I would suggest by targeting the leaders of the violent elements the police know exactly what they are doing. Break them up and break up the momentum & organisation of the violent elements. It is what our Police (in riot gear with Batons etc) do at Antifa/EDL type protests. Target and arrest the organisers. After 12 weeks, it's clear the matching force with force thing is not working for France and they are in a state of perpetual chaos and lacking leadership from the top. At what point do the French authorities need to take a different approach? Does working with leaders - both before marches and in marches - help to segment the protest and separate troublemakers? This yellow jacket movement feels deeply personal, and won't resolve itself while it remains so. The authorities have taken at least 2 different approaches over the period of the protests. From my reading, local authorities have talked with leaders (where they exist) of the peaceful protests, hence protests going over agreed times with no problems. The problem is the violent elements don't want to talk, they want the violence to continue. Matching force with force may be working as the violent protestors are gradually (including the leaders/instigators) getting arrested and protest numbers falling (if reports are to be believed). There is also a growing movement resenting the ongoing chaos caused by these ongoing protests. Both sides have big issues and are wrong in this. That seems to be your stated position on everything, but is not reflected in your follow up statements. I have no real ideological support for either side in this. I simply don’t believe that from your previous posts. You’re trolling. Typical. A semblance of balance aimed at pretending a naive debate, followed up with no content. 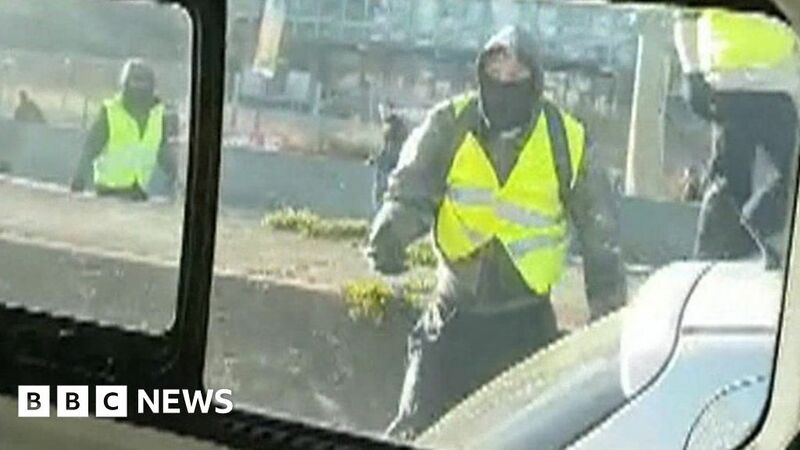 Your position that the french police are being unreasonable is based on your support of the principles of the yellow jackets rather than the actions themselves. And you’re artificially trying to force people into an untenable position of appearing to support police violence when they don’t. It’s a bit tedious and transparent. And thus peeling off the reasonable elements from the whackos is a bright thing to do. It takes two to tango doesn't it? If I was trolling you'd know it - instead I may suggest you read more than is there (again) because it's not your view. BTW, I don't support violence nor the idiots that do it - I will say it again to be clear - whatever their views. My contention is they are overly forceful by rote, it's not getting the desired results and causing life changing injuries needlessly in a one sized fits all blitz. The French cannot cope with this disobedience and seeing some of the memes from the injuries is an extremely powerful thing on social media and in part it's justifying the idiots actions. I will credit the UK Police for being smarter and more flexible in the face of previous similar issues - they seem to understand where the lines are, more often than not. Macron's looked like a lost banker recently, and not a politician. BTW. If I was trolling, I'd have posted about the state of the Democratic party in the US, particularly Virginia (just wow on many levels!) the new Green Deal from AOC (a very bright gal, completely naive but who will get it soon), Elizabeth Warren's slow car crash into irrelevance (1/1024th American Indian), the amount of jobs in Germany that could be affected by a no deal Brexit (could be 100k in German press at weekend, with 443k worldwide), the UK Police being more interested in tweets than crime, the speeding Labour MP, etc, etc. So the Authorities/Police are using various strategies then and doing what you wanted. You focus on the police response yet pretty much brush over the violence from the violent protestors and the destruction they inflict. How would you propose the Police stop those elements who are utterly intent on violence, attacking the Police (with weapons) and causing major criminal damage when it is a mob of them, not a few individuals? Bear in mind, these people want the violence to happen and go tooled up for it (I repeat again including Molotov cocktails). How would you protect something like the Houses of Parliament from a large, rioting tooled up mob? Release the dogs. Or the bees. Or the dogs with bees in their mouth and when they bark they shoot bees at you. How about some evil monkeys with wings? Can fly, throw faeces and drop grenades on the activists. Will they be the cheese eating Surrender Monkeys? Here's the Yellow Vests defending themselves from Police brutality again.